Kaley, who gets paid $1 million per episode of the hit CBS comedy The Big Bang Theory, started 2019 by attending the 2019 Golden Globe Awards at the Beverly Hilton Hotel in Beverly Hills. Her net worth is estimated to be around $55 million dollars. She hit the red carpet in a strapless Monique Lhuillier Fall 2019 gown, Brian Atwood shoes, and Lorraine Schwartz jewelry. At the InStyle and Warner Brothers’ annual Golden Globes after-party, Kaley was joined by her most recent husband, Karl Cook. They married on June 30, 2018. Karl’s father is Scott David Cook, an American billionaire businessman and the co-founder of Intuit. In October 2018, Kaley also attended the 2018 Veuve Clicquot Polo Classic at Will Rogers State Historic Park in the Pacific Palisades, California. She flaunted her legs in a Fendi Pre-Fall 2018 outfit paired with white Stuart Weitzman shoes. While Kaley landed her breakthrough role as Bridget Hennessy on the ABC sitcom 8 Simple Rules in 2002, most of her net worth derives from The Big Bang Theory, for which she has received Satellite, Critics’ Choice, and People’s Choice Awards. The twelfth and final season of the American television sitcom, which will run through 2018–19, premiered on September 24, 2018. In June 2018, Kaley stepped out for the Inspiration Awards at the Beverly Wilshire Four Seasons Hotel in Beverly Hills, California. She styled her MSGM lip print dress with pink Ash sneakers. How do you like Kaley’s black, pink and red lip print mini dress? Her smooth leather sneakers from Ash with geometric appliques have unfortunately sold out. While they would later get divorced, Kaley Cuoco and her professional tennis player husband celebrated their first wedding anniversary on New Year’s Eve 2014. They married on December 31, 2013, and divorced on May 6, 2016. The couple kept the fire burning at the Los Angeles premiere of The Wedding Ringer, where they were seen locking lips while posing on the red carpet at the TCL Chinese Theatre on Tuesday. The Bahamian-born tennis player looked dapper in a gray plaid suit with a white button-down shirt, a gunmetal tie, and a pair of brown oxfords. The Big Bang Theory star, on the other hand, stuck to the wedding theme in a sparkling $4,995 KaufmanFranco Fall 2014 strapless dress, which features an allover sequin embellishment, a figure-flattering A-line silhouette, and a cutout detail at the back. She carried a matching metallic clutch and completed her look with grayish Pedro Garcia sandals. The 29-year-old actress styled her pixie do into tousled waves with a crystal-embellished headband, while her makeup was gorgeous with lined eyes and glossy lips. Kaley showed off upper back tattoo showing three rows of large Roman numerals – XII.XXXI.XIII – inked between her shoulder blades. They mark her New Years Eve wedding date. After her divorce, she removed the massive Roman numeral tattoo. 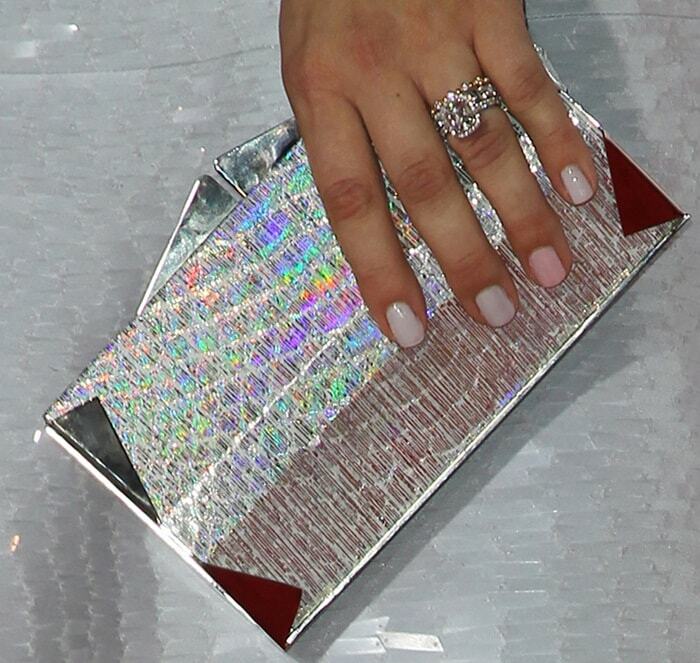 Kaley carried an origami-inspired metal box in “Hologram” python by Jill Haber featuring silver hardware. The “Cecily” sandals (available at Nordstrom) complemented Kaley’s lovely outfit. They are sleek with front straps, open toes, crisscross buckled ankle straps with metal eyelets, and 4-inch heels. It seems like Kaley was excited to wear the sandals. She even forgot to remove the sticker tags off the outer soles! Nothing looks as fresh as a strappy sandal, and this ankle-strap style from Pedro Garcia, with its sleek design, slender heel, and modern hardware is sure to become your go-to shoe for the coming seasons.